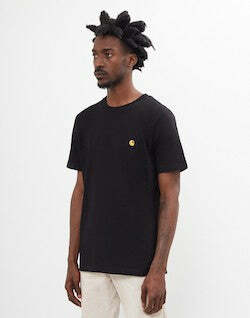 The plain black T-shirt is the basic essential that all of our buyer's stand by. However, it doesn't hurt to upgrade your wardrobe and refresh your jersey basics. Black T-shirts are suitable for most occasions, so take a read of our devised guide on the 10 best black T-shirts and how to style them. Opting for a men's black T-shirt may seem incredibly straightforward. Granted, it’s an easy choice. 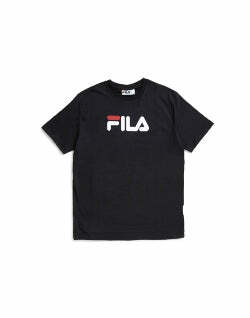 T-shirts are simple, functional and effortless items - the ultimate fashion piece for any Idle Man. If you have stuck with the same basic black T-shirt for a while now, perhaps it’s time you shook things up a bit? Check out our guide on the best black T-shirts for men. Before we get going on our top black T-shirt choices, a little introduction on T-shirt fits is necessary. The key to making the most of your black T-shirt is ensuring that you obtain the optimum fit. Anything too tight or baggy can be quite unflattering. So let's start at the very beginning (a very good place to start), with some handy hints and tips to guarantee that perfect fit. The best T-shirts for men are ones that lightly hug your frame. You should be able to pinch one to two inches of fabric at your sides. The sleeves should fall around the mid-bicep area with a light (not loose) fit. Opt for fabrics that are of good quality. Avoid anything too worn (unless you're going for that shabby-chic look). It takes minimal time and effort to throw on a black T-shirt for men, yet the end results can be stylish when worked with various outfit combinations. A fitted black T-shirt is one of the best plain T-shirts, especially if you’re looking to give your torso more definition. Choose a fitted black T-shirt and your shoulders will instantly appear broader. 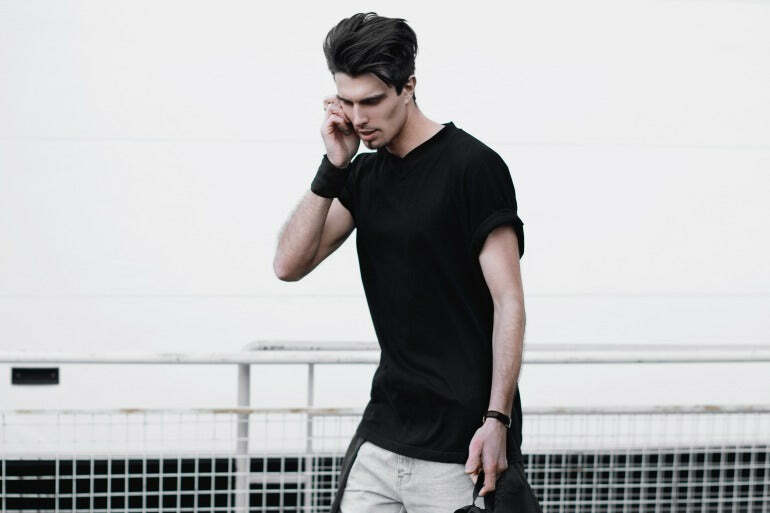 On the other hand, a loose or regular fit black T-shirt is great if you want to achieve a more casual look. If you're hoping to pull off a relaxed, athleisure style, baggier bottoms are better. 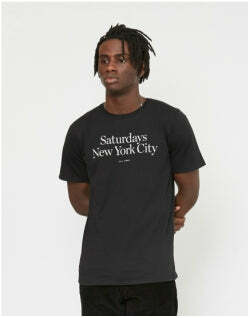 However, a loose fit T-shirt tends to work best with a pair of slim or skinny cut jeans, or a simple pair of shorts. 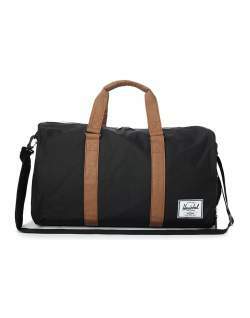 It's a classic staple item that's not only practical but adaptable too. Once you’re happy with your chosen fit, your next step is to consider the neckline. The neckline on a T-shirt might not seem particularly important at first, but there are certain body types that will suit one style over another. So it’s always best to be aware of all the options available to you. What you need to know is that this neckline will help give the illusion of a longer neck. If you’re looking for a way to improve your posture and add a bit of length to your torso, a V-neck T-shirt may well be your new material mate. It's handy to note that, as a general rule, the bottom of the V should not go past the top of your armpits. 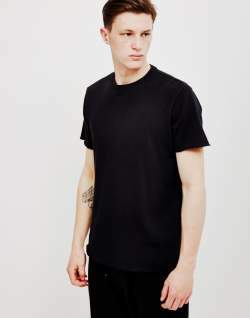 Unlike the V-neck, a black crew-neck T-shirt has a neckline that sits close to the neck. If you’re big on layering, a good quality crew-neck is a handy investment. 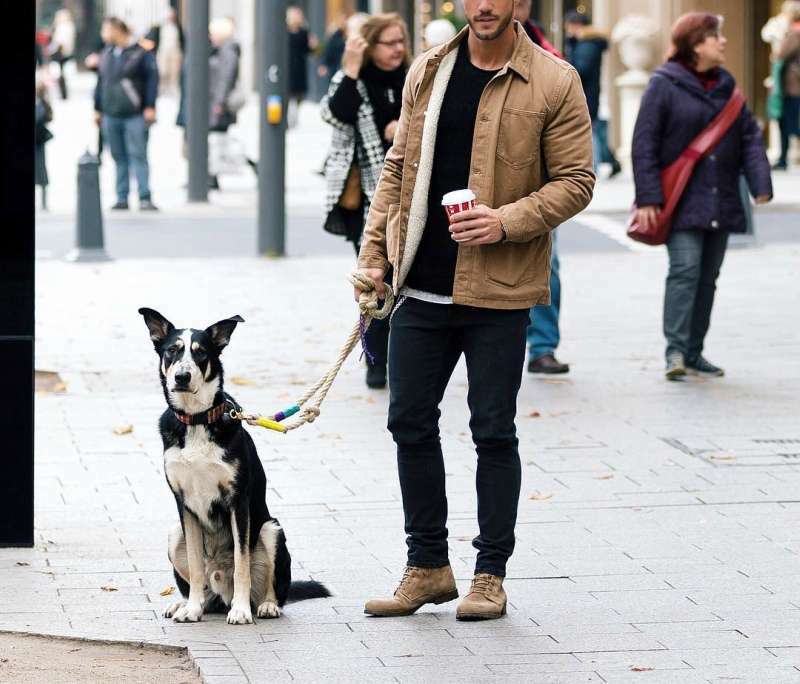 They work as a great base for any outfit combination, particularly perfect for those cooler months. If it isn’t already, a crew-neck T-shirt really ought to be an essential item in your wardrobe basics. It’s best to take note that a crew-neck T-shirt should have a comfortable fit and shouldn’t be too loose or baggy. The Idle Man's Sunday Club T-shirt is a great example of a quality crew neck. With a classic, regular fit, this tee is great for everyday wearing, with the added graphic pop of colour sure to inject some interest into any look. If you prefer to stick with the basics, a V-neck or crew neck T-shirt will do the job nicely. However, if you’re looking for something a bit more eye-catching and memorable, a scoop neck T-shirt might just do the trick. A scoop neck T-shirt is sure to add some dimension and character to your outfit. The style consists of a low round ‘scooping’ neckline and it works great as a statement piece. Perhaps wearing a simple black T-shirt leaves you feeling like a bit of a plain Jane? 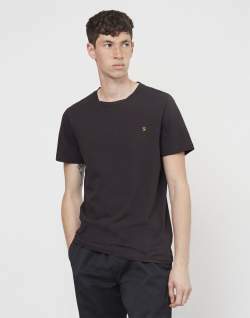 For those gents out there who are loud and proud with their fashion, a logo or textured black T-shirt offers a variation on the plain black T-shirt, yet will still maintain a look that boasts sharp simplicity. If you’re left feeling frustrated by the simple alternatives of a neckline and fit, revitalise your wardrobe with some T-shirts that boast interesting stripes, colours and/or textures. Just remember to avoid anything too busy or offensive. Keep it classy chaps. Also, patterned T-shirts are sure to help inject some colour into your wardrobe. But for those Idle Men who find colour too busy, yet still want to shake things up, you can go for more monochrome graphics that make for an interesting option that won’t command any excessive attention. If you’ve got the cash, you’ll find a few minor benefits from investing in more expensive black T-shirts. It is likely to have a better fit and be made using a higher quality material which will mean you can get a lot more wear out of it. However, if you prefer to keep things simple, there’s really no need to go maxing out your credit cards. 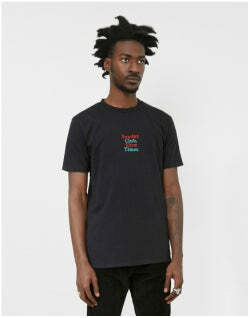 As black T-shirts are such classic, staple items, there’s really no necessity to go crazy here. If you’re keen to keep on trend, then, by all means, splash out. But if you’re simply looking to achieve an effortless style with minimum expenditure, save those hard earned pennies for a rainy day instead. Take a look at our top picks for the best cheaper black T-shirts at the affordable price. Black T-shirts really are the ultimate everyday item, and you can throw one on with confidence, knowing that you’ll be simultaneously stylish and comfortable. Black is a powerful colour, and when choosing what to couple with your tee, it’s very difficult to go wrong. Black T-shirts are the ultimate blank canvas from which an outfit can be built on. They act as great understated pieces - the perfect partner for any fuss-free Idle Man. A men's black T-shirt is possibly the most casual item you can ever own. With that, it's completely versatile to cater to any look - especially if your wardrobe is 70% black. To create a look which is comfortable, effortless, yet athleisure influenced, double up your black colourways. Layering your T-shirt with a bomber featuring a distinctive zip can turn a plain simple outfit into a modernised streetwear vibe. Lastly, clash your look with a smart shoe. This elevates your outfit from the casual, providing a touch of personality. If you're a man who prefers comfort over style, you’re probably no stranger to T-shirts, potentially wearing them on a daily basis. However, this doesn't mean that your basics jerseys can't see the light of day in your best dressed. An ideal look for the spring seasons, layer your black T-shirt with a navy overcoat. Avoid playing safe and switching to a black colourway, as this can lead to an outfit looking too heavy (or be mistaken to be dressing for a funeral). Lastly, to complement the navy and to pull it away from clashing with the darker shades, opt for a brown smart shoe or boot. 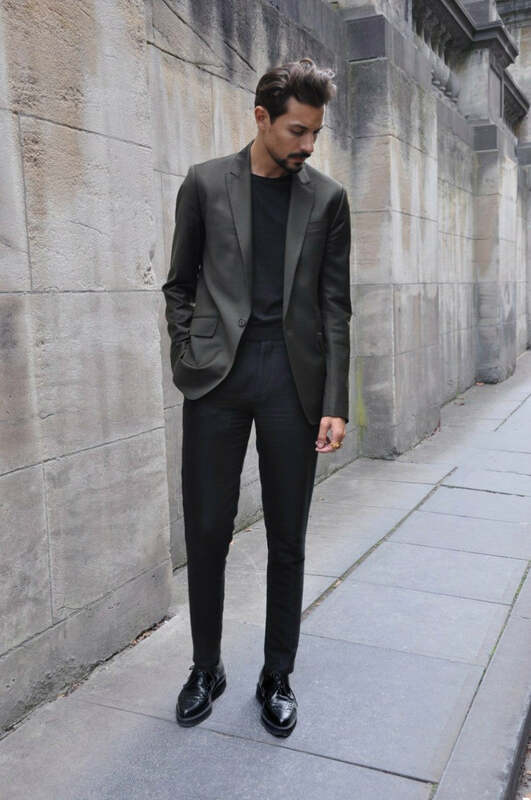 Despite its muted colour, comfort, and common association with casual wear, black T-shirts are certainly not off-bounds for more formal get-ups. 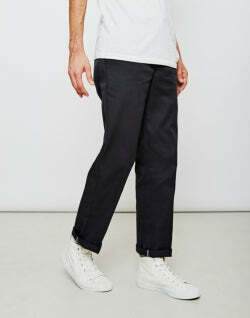 To add just a touch of formality, couple your black T-shirt with a pair of chinos or jeans, a blazer and smart shoes. This look provides the opportunity for you to experiment with colour. As black is one of the easiest colours to coordinate, don't be afraid to try something now. Avoid choosing black T-shirts that are too tight or baggy. Look for fabrics that are of good quality and replace your T-shirts when they start to wear. Lengthen your torso by opting for a V-neck T-shirt. Don't neglect your black T-shirts when it comes to more formal events. To make your black T-shirts last longer, wash them on a cold wash and allow them to hang dry. If you’re someone who likes to dress to impress, there’s really no need to neglect your black T-shirts any further. Where you once may have mistaken this classic item for a lifeless, boring necessity, we hope you’re now marvelling at its versatility and sophistication. Your black T-shirt speaks volumes without even making a sound. And if it isn't already, this understated item is definitely one for the wish list.